The worship of solar deities was wide-spread among the cultures of the eastern Mediterranean during the Bronze Age (Marinatos, 2010). This was especially true for the Egyptians. 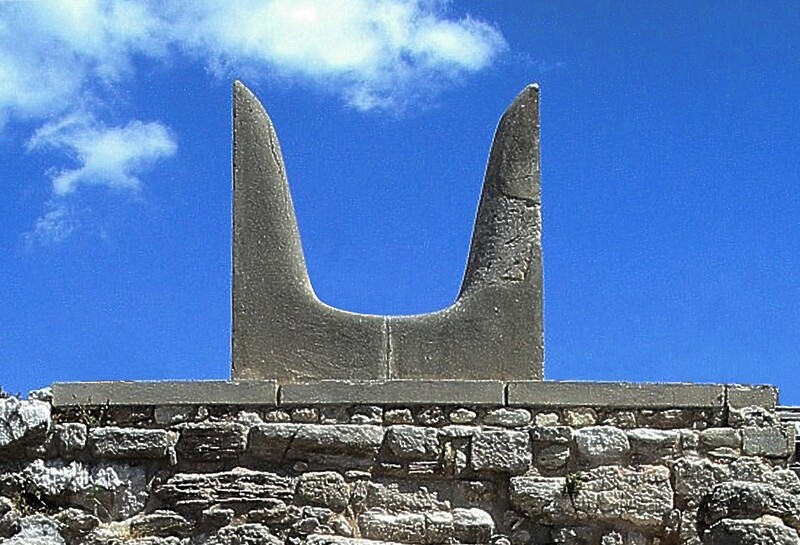 After its first appearance in the archaeology on Crete some scholars noticed that the "horned appearing" Minoan symbol shown above was also the Egyptian hieroglyphic sign for mountain (djew). In the context of Egyptian cosmology this symbol stood for much more. 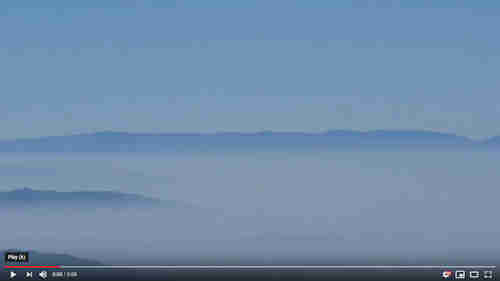 It depicted the twin peaks set at either edge (horizon) of the world that supported the heavens allowing the sun to voyage across the sky from sunrise to sunset. 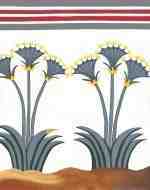 The Egyptian djew symbol is often depicted with a solar disk nestled in the valley between its peaks. This sun symbol was called kheper (the beetle) and represented the rebirth of the sun "coming into being" at sunrise (Watrous, 1995). It was kheper that pushed the sun across the sky from dawn to dusk just as a scarab beetle would roll a ball of dung across the ground. 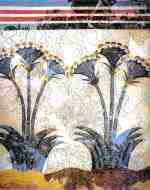 Sir Arthur Evans believed the Minoan "djew-like" symbol represented the horns of the sacrificial bull and named it the "horns of consecration" (Banou, 2008). By the Middle Minoan II (MM II) period this "sun symbol" could commonly be found throughout Crete on altars and the rooftops of architectural structures. 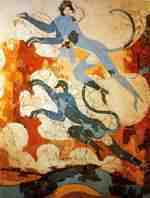 In 1909 Sir Arthur Evans excavated a puzzling new type of Minoan archaeological site on top of the prominent mountain peak just south of Knossos on Crete - Youkhtas. While already distinguished by its location on the summit of a mountain the artifacts recovered further asserted its unique character. During this excavation stone "djew-like" artifacts came to light for the first time as well as figurines depicting humans and animals, stone altars, bronze double axes, and symbols of Linear A writing inscribed on the durable surfaces of bowls and tables. Intriguingly water-worn pebbles were also found. These smoothed stones must have been picked from the river beds in the valleys below or from the seashore and carried up to the site. J. L. Myres was the first to use the term "Peak Sanctuary" in 1903 to describe these curious new archaeological sites (Myres, 1902-3). Since the time of Youkhtas' original excavation about forty sites have so far been identified as confirmed or probable peak sanctuaries on Crete as well as two sites on other islands in the Aegean - Agios Georgios on Kythira and Troullos on Kea. As recently as 2007 Krzysztof Nowicki published the identity of three new peak sanctuaries on the southwestern coastline of Crete - Aghia Kyriaki Gremnakas, Plakias Paligremnos, and Preveli Korifi. Any assumption that all of the peak sanctuaries have now been found would seem to be weak. Many of these sanctuaries sit near to or on top of tall peaks but there are several exceptions to this. Six of them are actually just small hills - Ephendi Christou, Piskokephalo, Profitis Elias, Gournia's South Hill, Trochilas Faneromeni, and Troullos on Kea. Some scholars have argued that these sites are not peak sanctuaries at all but rather "hilltop shrines" even though they are clearly associated with the phenomenon. 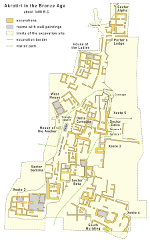 An important example of a sanctuary not located at the top of a peak is Karfi. It's a relatively short hike of about 2.5 miles (4 km) up to the summit of Mt Selena from Karfi which sits lower down the peak's western slope at a more habitable and comfortable elevation below 1,200 meters. Prinias in eastern Crete is positioned on a high ridge line overlooking the Bay of Sitia. Slightly above it is a relatively level plateau that stretches out broadly to the east. There is no peak at all! Also Atsipadhes Korakias is oddly found lower down on a spur of the northern slope of Mt. Kouroupa. Over the years different interpretations have been put forth to explain the purpose and function of the peak sanctuaries. The present thinking is they were religious sites focused on ritual cult activity while others have described them as communications centers, astronomical observatories, etc. This paper argues the peak sanctuaries were actually long-range solar (heliographic) "line-of-sight" communications centers that used silver and bronze "gravity formed" plates as mirrors to flash redirected sunlight across distances that could well exceed 80 miles (129 km). In 2009, with a good deal of expert help, I was able to very accurately identify and map in three dimensions the coordinates of the peak sanctuaries on Crete for my Aegean Minoan 3D GIS project on Google Earth. Given Crete's high-contrast geography I soon noticed the same thing Steven Soetens described in 2001 - the very strong 'line-of-sight' correlation of these peaks. They seemed to have been expertly selected for their distributed intervisibility. For example during the Proto-Palatial period Youkhtas could be seen by no less than nine other peak sanctuaries positioned around it. With these observations I began to take a serious look at the peak sanctuaries as functional communications centers. With my curiosity heightened I began my investigation by looking at what could have been used to perform signaling between these peaks. I could see that fire was the obvious effective choice for use at night but seriously doubted the ability and reliability of smoke being used for signaling in the daytime. 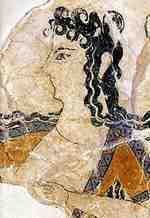 Having lived and sailed in the Aegean I knew of the strong winds that can sometimes blow for several days at a time. Any smoke used for signaling in the daytime would be quickly dispersed in these winds rendering them useless. Also the Aegean is well known for its haze which would tend to obscure any smoke signals sent at a distance. With this I completely discarded smoke as an effective signaling mechanism and began to look for an alternative that was securely within the technological capability of the Bronze Age Minoans. It soon came to me that they were well known for their use of mirrors (Castleden, 1993, p. 16). As a young teenager I spent a summer as a "sea scout" sailing but mostly rowing large open wooden boats on the Chesapeake Bay in the US. Part of our safety training involved the use of mirrors to flash sunlight for emergency signaling at a distance. Our training basically consisted of instruction on how to redirect sunlight to a target depending on the sun's position in the sky, being told that generally the higher you were above sea level the greater your range, and how to signal "S-O-S" in Morse Code (three short flashes, three long flashes, and three short flashes). I was amazed that such a small hand-held mirror reflecting the power of the sun could be so effective over distances of many miles and never forgot it. 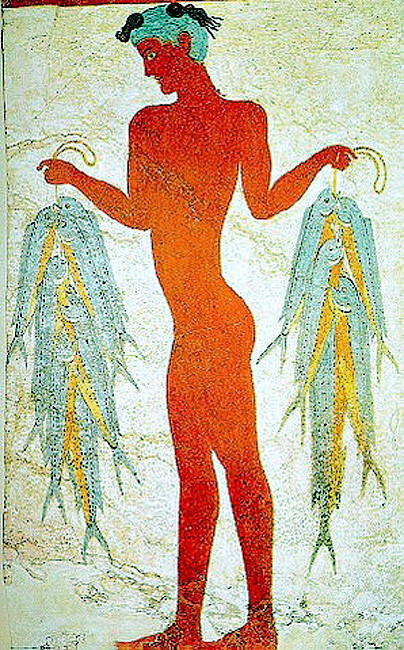 After mapping the peak sanctuary's "line-of-sight" interconnections on Crete and accurately measuring the distances involved it became clear the Minoans doubtlessly could have used the peak sanctuary sites as a "solar network" to effectively communicate using mirrors. The Aegean Sea's climate is consistently very sunny especially in the south with Crete having about 300 clear days of sunshine every year and among the area's 1,400 islands and islets are some mountain peaks that tower far above the surface of an at times fiercely wind-swept sea. Many of these peaks are well within sight of one another. This high-contrast geography and sunny climate make for an ideal environment for the incubation of visual "line-of-sight" signaling and communications. Some of the peaks in the Aegean are comparable to or far exceed the height of anything so far built by man. Amorgos, Krikelos - 814 m, 2,671 ft.
Chios, Profitis Ilias - 1,261 m, 4,137 ft.
Crete, Kofinas - 1,166 m, 3,825 ft.
Karpathos, Profitis Hlias - 689 m, 2,260 ft.
Kea, Profitis Ilias - 556 m, 1,824 ft.
Knidos, Bozdag - 1,150 m, 3,773 ft.
Kos, Dikaios - 816 m, 2,677 ft.
Lesvos, Profitis Hlias/Lepetymnos 921 m, 3,022 ft.
Milos, Profitis Ilias - 738 m, 2,421 ft.
Naxos, Za - 981 m, 3,219 ft.
Rhodes, Attaviros - 1,207 m, 3,960 ft.
Samos, Profitis Ilias/Karvouni - 1,142 m, 3,747 ft.
Samos, Vigla - 1,412 m, 4,633 ft.
Sifnos, Profitis Elias - 653 m, 2142 ft. The first mirrors known to me that were made for this purpose are the small (~9 cm) highly polished obsidian (volcanic glass) disk mirrors found by Mellaart at the Anatolian neolithic settlement of Catal Huyuk dated to about 6,000 BC (Enoch, 2006). Before the coming of cast metals any wetted dark polished stone or ceramic bowl filled with water or oil could have served as a relatively effective mirror. The ceramic "frying pans" from the Early Cycladic period in the Aegean have a raised lip with no holes in the bottom and have been interpreted as possible liquid mirrors. The only reason these mirrors were somewhat effective at all was due to the force of gravity acting on the fluid's surface. When given enough time to settle in a vibration free environment gravity will eventually force the surface of the fluid to conform to the curvature of the earth. This would create an almost perfectly flat surface providing a very accurate reflection of the light striking it however dim. The first metallic mirrors in the archaeological record are small disks of polished copper of unknown composition made in the 4th millennia BC in Mesopotamia and Egypt (Enoch, 2006). The Bronze Age Minoans of the 3rd millennia BC were masters at working with their four most important metals - gold, silver, tin, and copper. 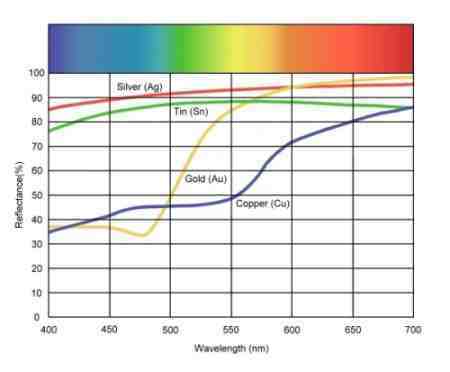 In their pure form all of these metals are shiny reflectors of visible light. 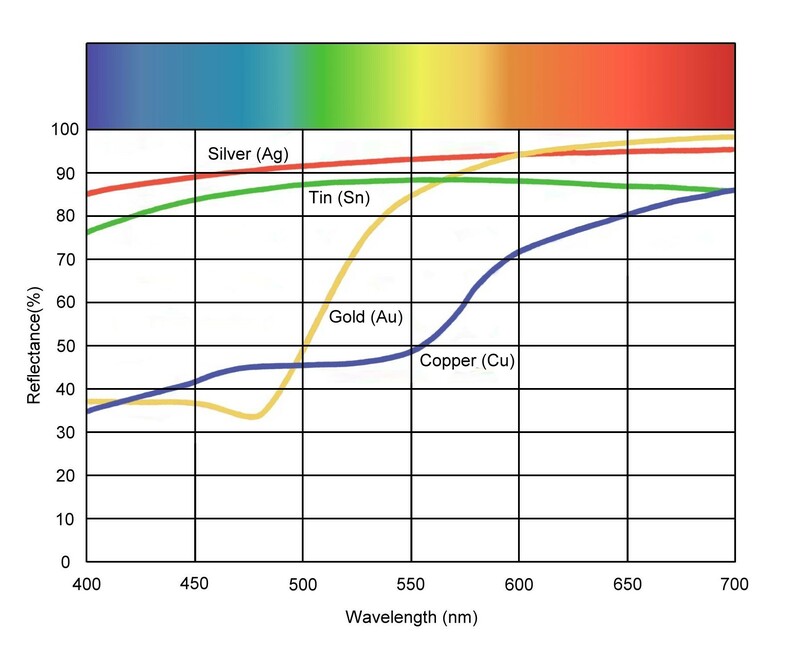 While gold and copper are less efficient tin is an excellent reflector but silver has the highest reflectivity to visible light of any substance known. The alloy of true bronze (copper with typically 6% to 15% tin) began to rise to dominance over arsenical copper as the metal of choice in the Aegean by about 2600 B.C. It was a great technological advance that significantly outperformed arsenical copper at a cheaper cost of production. The fluidity of molten bronze and silver is similar to water at room temperature and like any low-viscosity liquid poured into an open mold gravity immediately begins to force the liquid's surface to conform to the curvature of the earth. By the time the metal cools and sets into a solid its top surface will be as perfectly flat as was possible in the Bronze Age. This is how their mirrors were made. 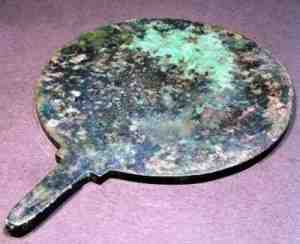 The Egyptian bronze mirror shown below clearly shows it was cast as a flat plate. Width: 14.2 cm (5.6 in), Height: 18.5 cm (7.3 in). Another property of bronze that couldn't have escaped their notice was that it's an excellent reflector of visible light. While not as good as silver the first really excellent non-silver mirrors could now be much more cheaply made. 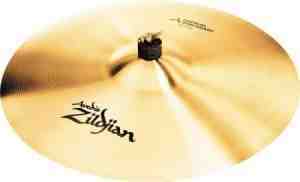 As shown below some modern bronze cymbals are made with different mixtures of tin and copper. This is intended to indicate the change in reflectivity as more tin is added to the copper. While the composition of Minoan mirrors is currently unknown it's hard to imagine the furnace masters not experimenting with different mixtures of copper and tin over time to empirically determine their properties and characteristics. Speculum is a high-tin variation of bronze typically composed of about two-thirds copper and one-third tin. The reflectivity of speculum is dramatically more tin-like and effectively mimics silver. It's also resistant to tarnishing thus reducing the polishing and care required to keep the mirror as reflective as possible. When Isaac Newton was building his first reflecting telescope in 1668 he chose an alloy called "bell-metal" composed of six parts copper, two parts tin, and one part arsenic (a variant of speculum) as a reasonable, far less expensive, and more tarnish resistant alternative to silver for its mirror. 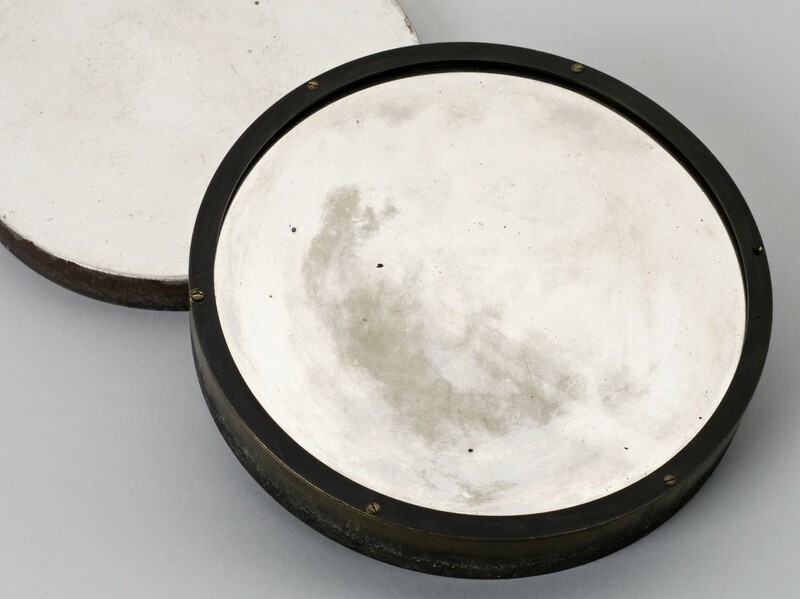 The musician/astronomer William Herschel made hundreds of speculum mirrors for his telescopes between 1773 and 1820. Using a telescope equipped with one of these high-tin bronze mirrors he discovered the planet Uranus in 1781 (King, 1955). The archaeology is very clear on this. 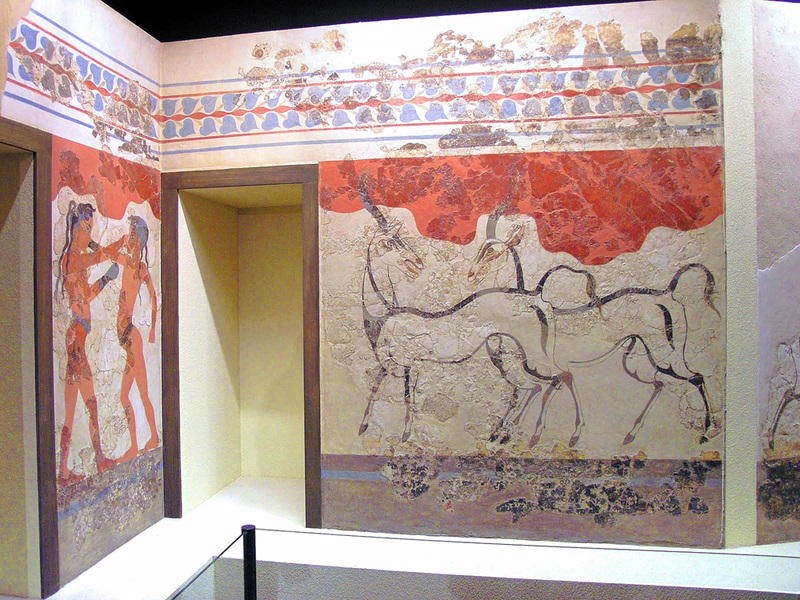 The Minoans cast, polished, and used mirrors just like their Egyptian contemporaries and the implementation of a heliographic communications network on the very high-contrast geography of Crete and the Aegean is well within the envelope of Bronze Age Minoan technological capability. 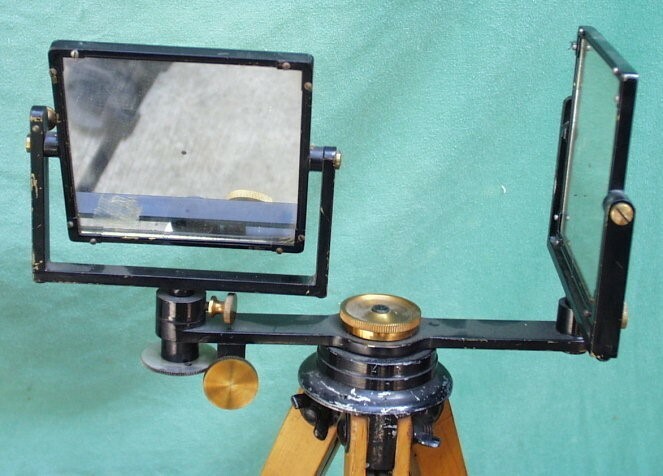 Mirrors were extensively used during the 19th and early 20th century for long-distance surveying and military communications. In 1818 the German mathematician Carl Friedrich Gauss invented a mirror-based instrument to assist in a geodesic survey of the state of Hanover called a heliotrope. 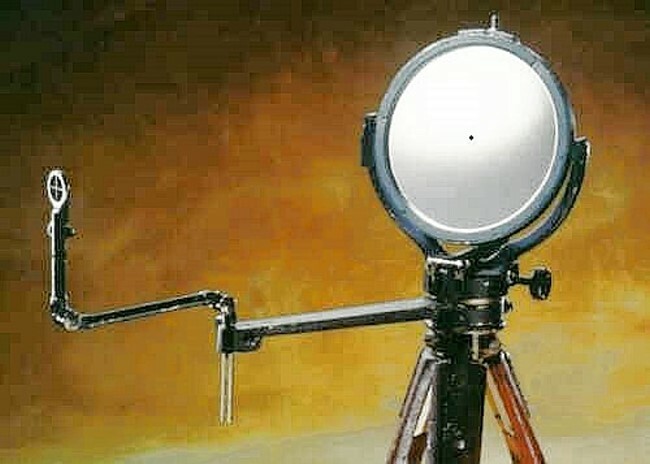 The sunlight redirected by its mirror could be seen at much greater distances by observing surveyors using an instrument called a theodolite which measured the vertical and horizontal angles of a small sighting telescope pointing at the mirrored light of the heliotrope. This was used in triangulation surveys to accurately measure the distances in a landscape. Distances of over 100 miles have been regularly achieved by heliotropes used as survey targets (Dunnington, 1955). In 1878 B.A. Colonna of the USCGS successfully surveyed Mt. Saint Helena from Mt. Shasta in California which is 192 miles (309 km) away with the aid of a telescope (Colonna,1880). 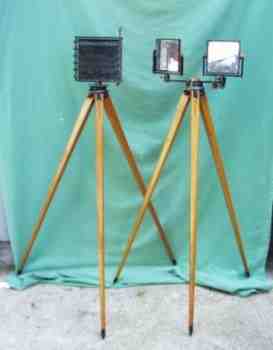 A heliotrope operator would sometimes use another mirror for signaling the distant theodolite crew of his status. 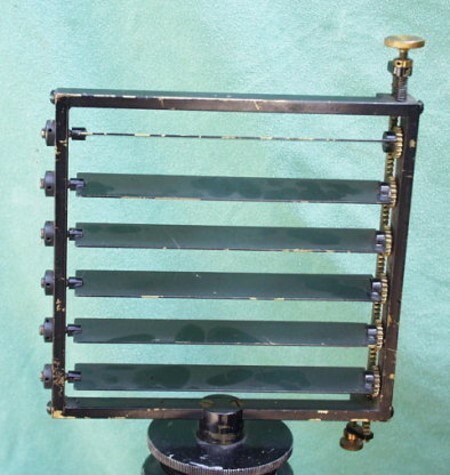 This was noticed by Sir Henry Christopher Mance of British Army Signal Corps in India who then set about developing a mirror-based instrument that flashed sunlight in Morse code for military communications called the heliograph. 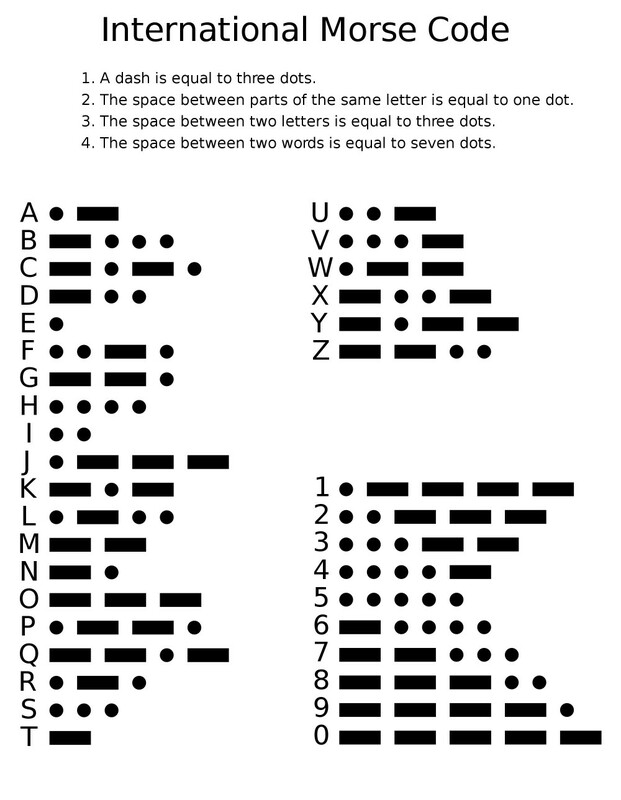 At the time the dots and dashes of Morse code were widely used for land telegraph and submarine cable operations. The device he created weighted only about seven pounds and could be easily carried, setup, and operated by one person. It was first used in a war setting in India in 1877 (Coe, 1993). 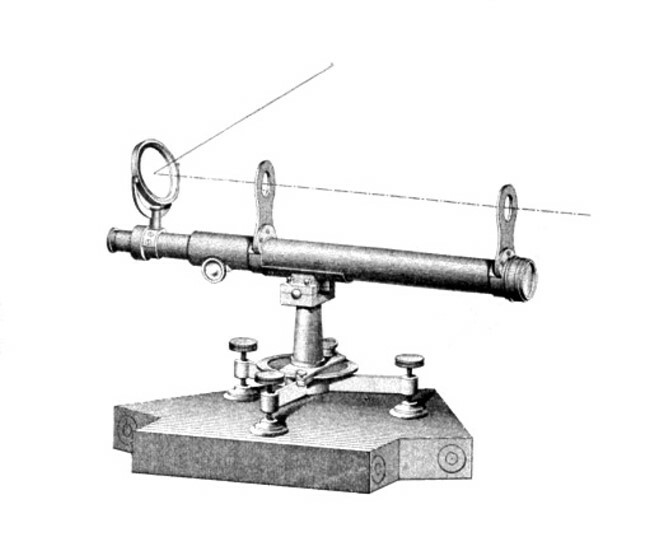 Despite being limited to use in sunlight, requiring a clear line of sight, and the mirror needing to be regularly corrected for the movement of the sun this simple, lightweight, and highly effective solar telegraph was the only means of communicating at distances of up to 100 miles (161 km) or greater before the advent of radio and would remain an important component of military communications for over 60 years. It was issued to the British and Australian armies as standard equipment as late as the 1960's and is still a vital part of emergency survival kits for signaling search and rescue aircraft. 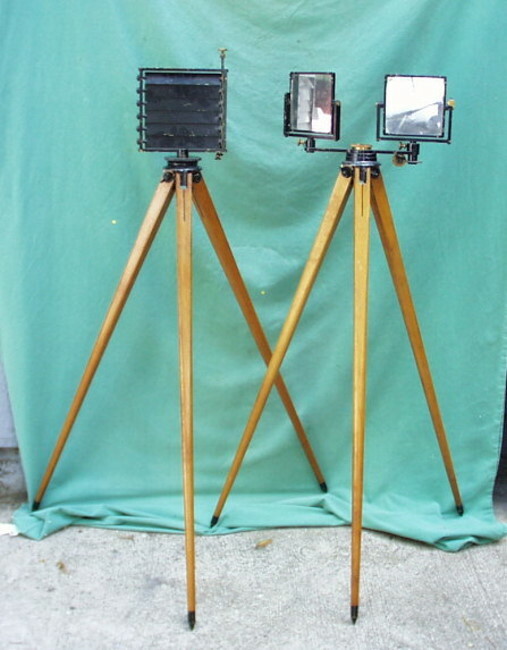 In its day the mirror-based heliograph was the most powerful signaling instrument known (Coe, 1993). The heliograph's range depended on the clarity of the atmosphere between the sending and receiving sites and the size of the mirrors used. The rule of thumb for mirror range vs. size was about 10 miles (16.1 km) for each inch (2.54 cm) of diameter. In 1894 the U.S. Signal Corps set a telescope aided record of 183 miles (295 km) when they established a connection between Mt. Ellen, Utah (11,486 ft, 3,501 m) and Mt. Uncompahgre, Colorado (14,321 ft, 4,365 m) using only 8 inch (20.3 cm) square mirrors (Coe, 1993). 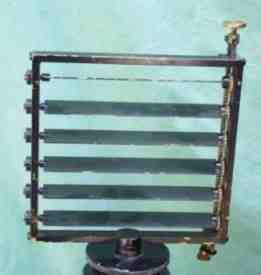 The Mance heliograph's mirror had a small sighting hole in its center. Looking through this hole the operator would first align the sighting post in front of the mirror with the target. The mirror was then turned to direct the redirected sunlight toward the target. Once the small dark shadow cast by the mirror's sighting hole was aligned with the cross hairs of the front post the aiming to the target was complete and the operator could begin flashing a message in Morse code. In the case of the Mance heliograph the code flashes were produced when the operator pushed a keying mechanism at the back of the instrument. This would slightly tilt the mirror up a few degrees away from the line to the target. 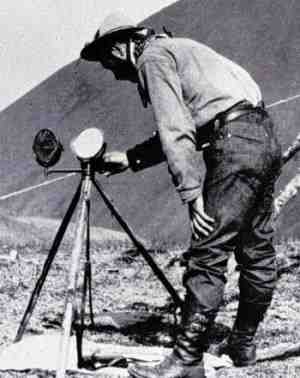 The U.S. Signal Corps developed a heliograph with two tripods. A shutter was mounted on one and dual mirrors on the other. Instead of tilting the mirror to create the code flashes the operator would open and close the shutter using a keying mechanism. Only one of the two mirrors was needed to redirect sunlight to the target if both the sun and target were in front of the operator. If the target was to the front and the sun behind the operator the second mirror would be used to face the sun and redirect its light into the mirror aimed at the target. The simplicity and portability of their mirror-based instrument allowed the operators to move freely about on the terrain and setup a long distance communications site wherever they felt was appropriate or expedient. Yet at any time a permanent infrastructure of fixed installations linked to span a network of hundreds of miles could be setup with relative ease. 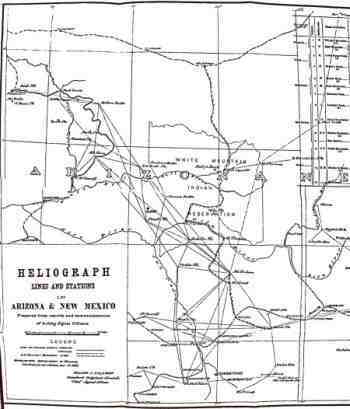 Just such a fixed heliographic network was created by the U.S. Army's Gen. Nelson Miles in the campaign against Geronimo beginning in 1886 during the Apache wars in Arizona and New Mexico (Miles, 1896). 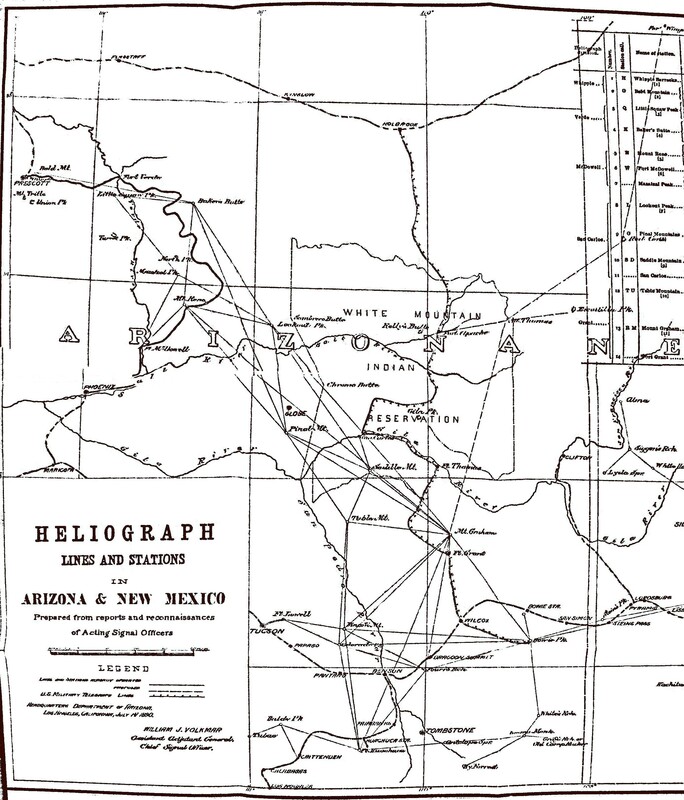 From the 1st to the 15th of May, 1890 the US Army's Department of Arizona, under the command of Assistant Adjutant General and Chief Signal Officer William J. Volkmar, conducted a major heliograph communications practice that spanned Arizona and New Mexico. "Two thousand miles of lines were operated, and the distance of 75 miles, which had previously ruled as the greatest range, was exceeded by ranges of 85, 88, 95, and 125 miles, and a perfect network of communication was maintained for two weeks over a country inconceivably rugged and broken, the stronghold of the Indians of that section. The stations were manned by 33 officers and non-commissioned officers, and 129 operators, and 3,785 messages were exchanged, comprising 92,406 words." (Annual Report of the Chief Signal Officer, United States Army Signal Corps, 1890, p. 41, Credit: Richard A. Fowell). Heliographic Network from the Library of Congress. The majority of mirrors used in this practice were quite small - 4 1/2" square. This is only about 33% larger in terms of surface area than the modern hand-held 3"x5" survival mirror used primarily for emergency rescue signaling. But some of the prominent peaks in the network like Mt. 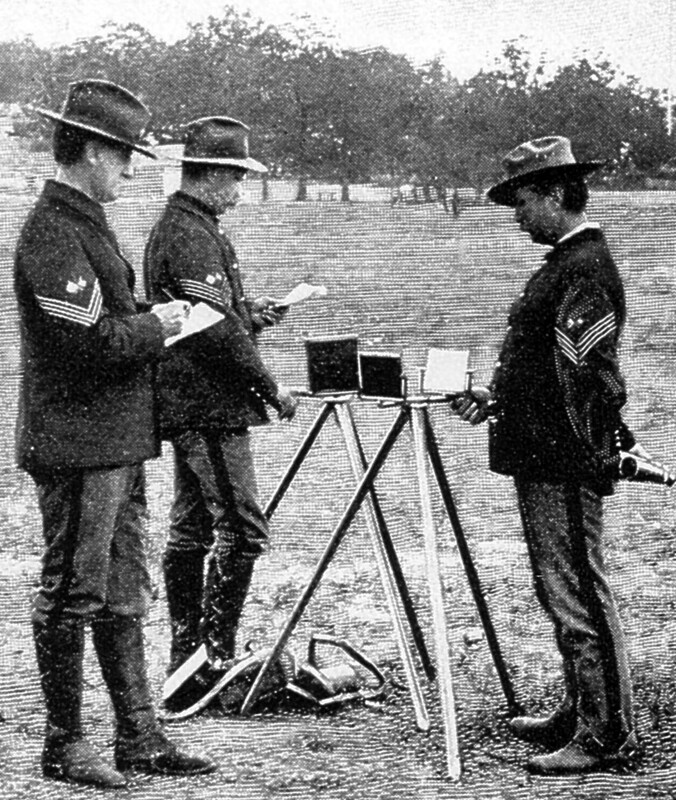 Graham used larger 8" square "station mirrors" with an effective surface area of 64 square inches (Annual Report of the Chief Signal Officer, United States Army Signal Corps, 1890, p. 45 & p. 71, Credit: Richard A. Fowell). By comparison a 1'x1' mirror with a surface area of 144 square inches would have reflected 2.25 times the light and a 2'x2' mirror with 576 square inches of surface area would have reflected 9 times the amount of sunlight of the Army's 8" station mirror. The larger the mirror the greater the range. "Up to the 12th instant, the atmosphere was clear enough for good signaling at ordinary ranges, but not for long range practice, as up to that date we hardly ever could see the flash from Graham without glasses. 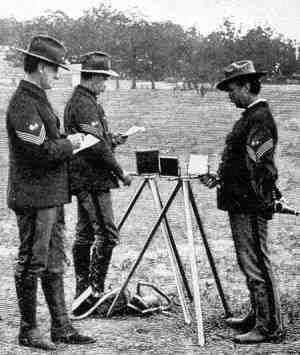 The 12th and 13th instants were the clearest days we had; the flash from Graham was plainly visible with the bare eye, and portions of messages would be read without glasses", (Annual Report of the Chief Signal Officer, United States Army Signal Corps, 1890, p. 33, Credit: Richard A. Fowell). 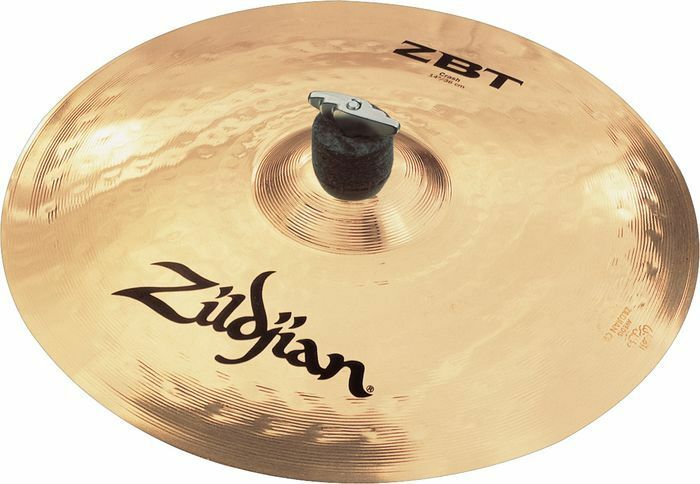 According to the "Ten miles per inch of mirror diameter" rule of thumb the Mt. Graham station should have been using a mirror of at least 10" square to reliably communicate over this link of almost 100 miles. Also, in order for light to be flashed to the northwest from Mt. Graham with the sun at their back it would have required using both of the 8" mirrors on their tripod. There is always a reflected light loss of about 6 to 10% when using both mirrors that is equivalent to using a single mirror with a somewhat smaller effective surface area. 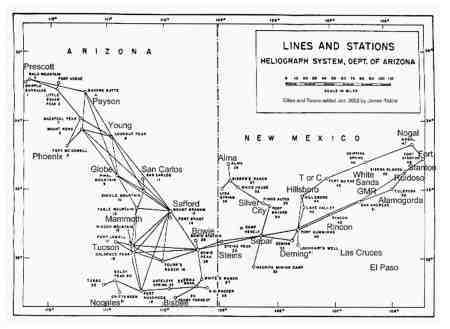 "May 8th, a station heliograph was received from Colorado Peak and the same day it was adjusted upon Mount Graham, and from this time until the 13th, continual search was kept up for that station. 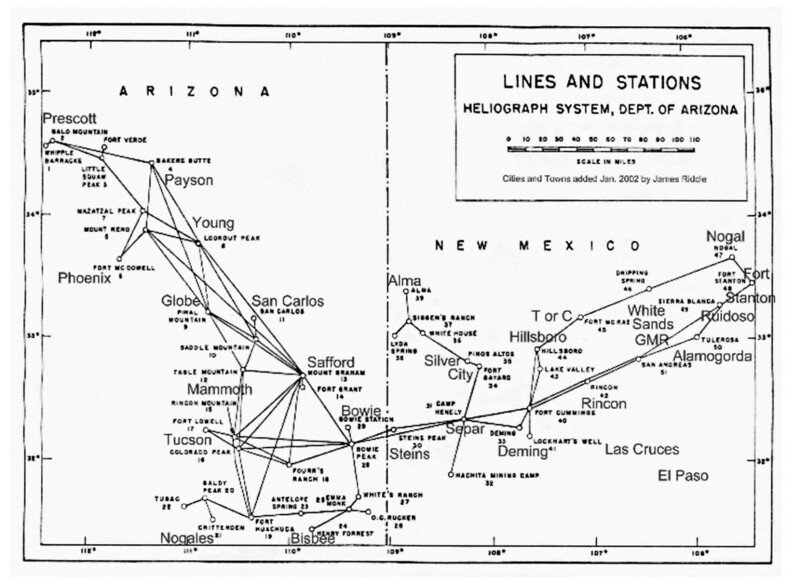 May 13th communication was established, this making the third station worked from Huachuca. Two messages were sent and two received, when the signal to "close station" was received, and other calls during the day were not answered by Graham. There was no difficulty in reading with the naked eye the two messages received", (Annual Report of the Chief Signal Officer, United States Army Signal Corps, 1890, p. 52, Credit: Richard A. Fowell). The Operation On-Target program of the Boy Scouts of America currently practices large-scale mirror operations in North America. Every year hundreds of scouts gather on peaks across the western US to establish contact with one another. These mirrors range greatly in size from large 2'x2' mirrors to the small 3"x5" survival signal mirrors. Bob Church the SW Region Coordinator of Operation On-Target reported that over the years many mirror flashes have been spotted from great distances. 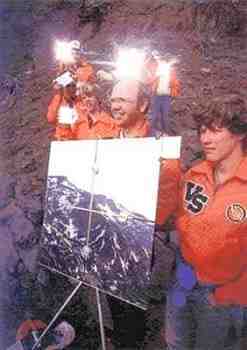 On September 18th, 2010 a new optically aided Arizona verified state record of 137 miles was set from Mogollon Rim to Mt. Graham with a 2'x2' mirror and binoculars. In 2009 one of his varsity scout teams was able to flash South Mountain near Phoenix, Arizona from Mt. Lemmon above Tucson with a small military 3"x5" retro-reflective mirror that was seen with the unaided eye. This was a radio verified distance of about 94 miles. 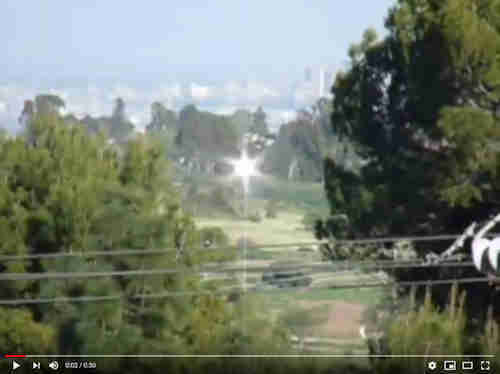 "This is the longest-range signal mirror flash we caught on video during the Southern California Operation On-Target. The flashes are originating from a Scouting group on the grounds of Palomar Observatory, and I filmed this from Mount Keller, 59 miles north, where another group of Scouts successfully signalled back. The flashes are a couple pixels below the horizon, left of center. Note that we were using large mirrors (12"x12"), not backpack size - 59 miles is to far to count on seeing a small mirror with the naked eye (10 miles per inch of mirror side is the rule of thumb)." Quote: "Our Operation On-Target range record is 180 miles, though the best any team I've been on has done is 75 miles (enough for your purposes). I was present when a team North of me and one South of me connected at a 90 mile range." - Richard A. Fowell, 6/1/2018. 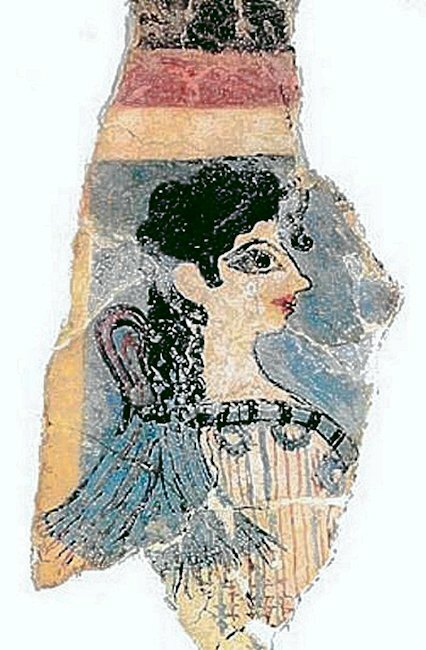 One of the most interesting archaeological expressions of the transformation of Minoan material culture that helped define the beginning of the Proto-Palatial period on Crete is the appearance of the peak sanctuaries spread across Crete. The mapping of the distributed interconnected 'line-of-sight' network created by these sites demonstrates just how profound their intervisibility was. If they weren't used for solar communications with mirrors during the day and fire signaling by night they certainly could have been and on a scale that spanned most of Crete. Once the decision was made to implement a 'line-of-sight' communications system on Crete a top priority would have been to identify the sites that would comprise the backbone of the network. 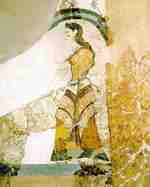 The most obvious first choice was Youkhtas (783 m, 2,569 ft) which towered over Knossos just six kilometers to the south. Over the centuries this distinctive landmark would have guided many Minoan ships to their ports on the coast. To the south there is Kophinas (1,166 m, 3,825 ft) which overlooks Crete's southern coast with a direct connection to Phaistos. 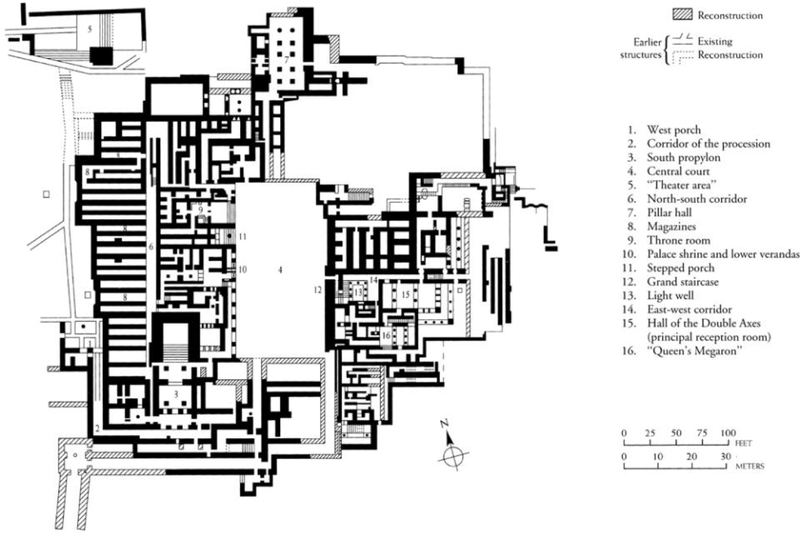 A message from Knossos palace could be sent with just two relays before being received in Phaistos. The message could have been originated and delivered in just a matter of minutes. This would have been a stunning and truly revolutionary breakthrough in Bronze Age communications. To the west of Youkhtas is Tylissos Pyrgos (670 m, 2,198 ft) and a higher peak (763 m, 2,503 ft) just a short 2 mile (3.2 km) walk to the north. This higher peak has a direct 'line-of-sight' connection with Vrysinas (827 m, 2,713 ft) some 28.5 miles (45.9 km) to the west. The lower peak where the remains of the sanctuary were found does not, but it does have an excellent wide view to the east. Some 18.5 miles (29.7 km) to the east of Youkhtas is the well-known peak sanctuary of Karfi (1073 m, 3,520 ft). 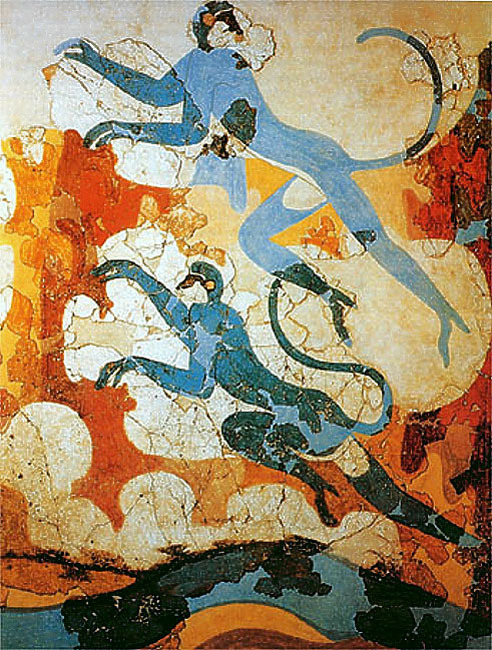 Karfi, Kophinas, Prinias in the east, Tylissos Pyrgos, Vrysinas in the west, and Youkhtas would remain the backbone peaks of the Minoan solar network from the beginning of the Proto-Palatial until the great eruption of the Santorini (Thera) marine volcano. But there is one more "true" peak sanctuary that needs to be included in this list - Syme. Can a peak sanctuary be located on the side of a mountain with little visibility? The archaeological site of Syme is located about half way down the southern slope of Afendis Christos at an elevation of 1,137 meters (3,730 ft) in a recessed area that has no visibility to the north or east and very limited visibility to the west. While certainly not a peak the site is strongly associated to the peak sanctuary phenomenon with its excavated finds - offering tables, pebbles, Linear A, Cretan Hieroglyphics, etc. and it even had its own Neo-Palatial villa (Building S). Many have described it as a religious sanctuary complex but understandably never as a peak sanctuary because of its location. Syme is protected from the winds, has a permanent water supply with a spring immediately to its east, and is situated at a relatively more comfortable elevation of below 1,200 meters. 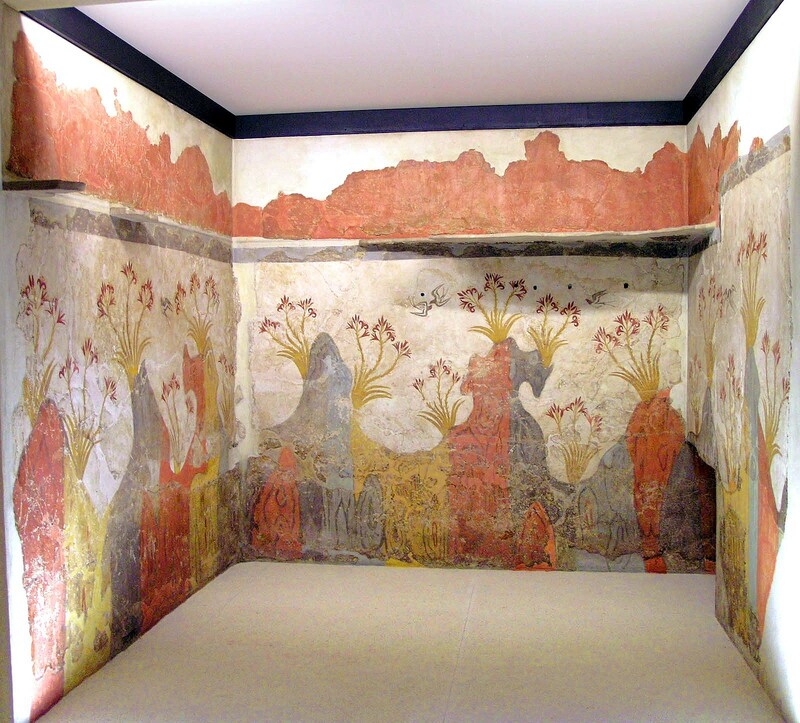 The Minoans never established a peak sanctuary above 1,200 meters on Crete. They may have considered 1,200 meters as the limit for permanent habitability. Syme is a perfect location for a year-round support settlement for fixed and portable mirror operations on the small Lapatho Plateau just a short walk of about 2 km (1.2 miles) to the southeast. From here looking to the west you could see the entire south central coast of Crete with a clear 'line-of-sight' connection to Kophinas 26.2 miles (42.2 km) in the west. Another kilometer or so to the east is a ridge line of small peaks that offers an incredible view of the southern coast of eastern Crete. The little Lapatho plateau with its ridges and peaks is a premier southern gateway for 'line-of-sight' intervisibility bridging central and eastern Crete. The highest of the peaks on Lapatho is 1,361 meters (4,465 feet). They wouldn't have wanted to build a permanent settlement in a place so much more exposed to the cold winds when their warm protected settlement was just a short walk away. After dawn two mirror crews consisting of at least a mirror operator and transcriber would have made there way to the plateau in about 20 minutes. The crew assigned to Kophinas could setup their mirrors wherever a clear line to it was available on the plain. A small permanent fixture constructed on the plain that gave them the line to Kophinas would have been operationally convenient and they may have used a wooden windbreak or temporary shelter to give them some protection from the wind during operations. With the morning sun rising in the east there would have been a favorable angle of incidence for a single mirror from Kophinas to begin flashing messages to Lapatho. The operator would interpret the flashes and verbalize the syllable, logogram, number, etc. 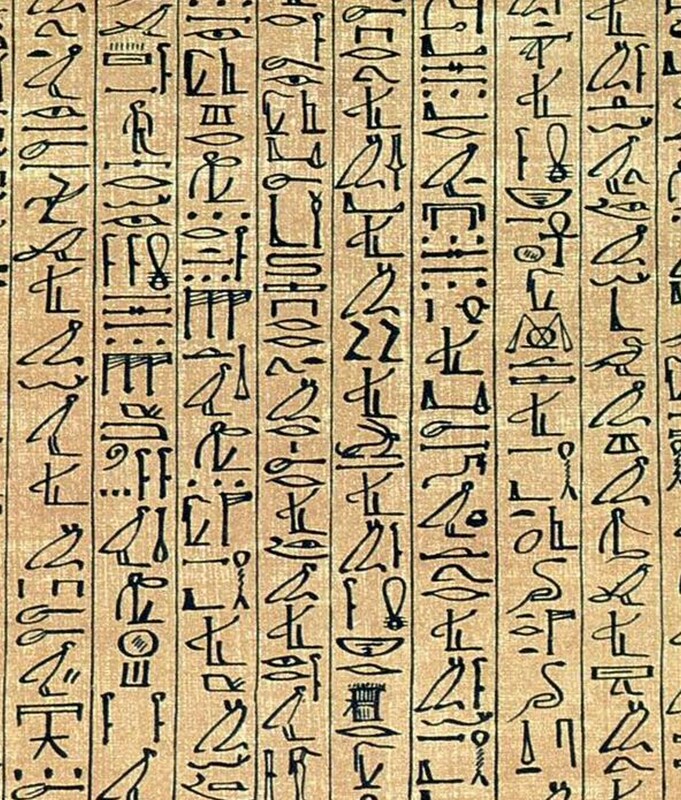 to the transcriber who would then draw the corresponding Cretan Hieroglyphic or Linear A sign of the flash code on parchment. Alternately once the Syme operator had sighted and aligned his mirror equipment to Kophinas the sending of messages could commence. 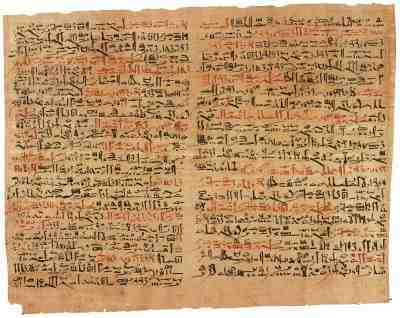 The transcriber, now reader, would begin vocalizing the signs from each message on parchment and the operator would send the corresponding flash codes to Kophinas. If the mirror crew on the eastern side of Lapatho received any messages ultimately intended for Knossos a courier could quickly deliver them to the crew lower on the plain assigned to Kophinas for immediate retransmission. Any messages received by the crews intended for the local area would be taken back to Syme for delivery by courier to the recipients. Once operations were complete the crews could easily return to the comfort and warmth of their quarters in Syme with perhaps another set of crews recommencing operations in the afternoon. Similar operations would have occurred regularly within the working areas of each "peak sanctuary". Almost due north of Syme is Karfi which is certainly located on a high point but it's actually much lower down on the western slope of Mt. Selena (1,526 m, 5,007 ft). It has great visibility to the west and north but its view to the northeast toward Malia and to the east is blocked by the mountain. A mirror crew from Karfi would have needed to hike about 1.5 miles up the slope of the mountain to the east in order to communicate with Malia's "hilltop shrine" Profitis Elias (78 meters, 256 feet). The top of Mount Selena is only about 2.5 miles (4 km) to the east of Karfi which would have taken a crew about 45 minutes to reach. Upon arriving an observer would have had exceptional visibility to the east and north with a direct 35.5 mile (57.1 km) connection to Prinias - the primary communications hub for eastern Crete. Daily mirror operations would have been very similar to those at Syme. Can a peak sanctuary be located on top of a small hill? Over the years scholars have identified several quite small, low-elevation hills associated with the peak sanctuary phenomenon. Some have questioned this association but if you look at these sites as part of a heliographic communications network their purpose becomes clear. All of them had a line-of-sight connection to one of the backbone peaks and all are located very close to significant population centers. Three of these "hilltop shrines" directly serve palace centers. The South Hill site is only some 500 meters south of Gournia with Ephendi Christou about the same distance west of Phaistos and Profitis Elias is just 800 meters south of Malia. Any solar message sent to one of these hilltops from a network hub could be delivered to the palace in a matter of minutes. While Piskokephalo is more centrally located to serve a wider area it's still only about 3.2 km (2 miles) southwest of Petras with Sitia just to the north. A messenger could leisurely walk this distance in about 40 minutes. The case of Trochilas Faneromeni is especially telling. Papadiokampos was an important Minoan town that sits on the northern coast at a very low elevation several miles northwest of Petras. Its view of the rest of Crete is almost completely blocked by tall peaks to the west and a high ridge line that runs from the southwest to the northeast where it ends at the neck of a low, small rocky peninsula that juts out into the sea. Walking from Papadiokampos to the east a little over a mile the high ridge suddenly drops toward the sea onto the neck of the peninsula opening up a panoramic view of the mountains of eastern Crete. From here you can not only see the backbone site of Prinias but Modi and Kalamaki as well. The hilltop shrine Trochilas Faneromeni sits on this little peninsula only about 2.5 km (1.6 miles) to the east of Papadiokampos - about a 30 minute walk away. Trochilas Faneromeni was perfectly positioned to distribute solar messages to/from the heliographic network as the service center dedicated to Papadiokampos. 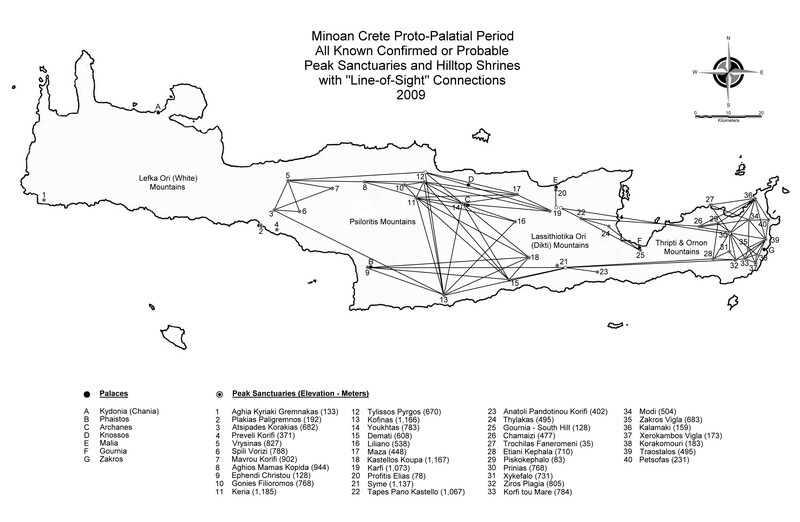 Oddly the above map shows no 'line-of-sight' connections in western Crete. This should not be. If this truly was a heliographic communications network the important palatial center of Kydonia (Chania) on the northwestern coast should have had a connection to the rest of Crete. While it's possible some other peak in the area could have served this purpose the most probable site for a peak sanctuary serving Kydonia (Chania) is Malaxa (585 m, 1,919 ft) which is located about 5 miles (8.0 km) to the southeast. The Neo-Palatial villa Nerokourou is located very close to this peak to the northwest and it had no less than eight direct "line-of-sight" connections during the Proto-Palatial period to peak sanctuaries in the east (Atsipades Korakias, Vrysinas, Spili Vorizi, Mavrou Korifi, Aghios Mamas Kopida, Gonies Filioromos, Keria, and Tylissos Pyrgos). In 2007 Krzysztof Nowicki published the identity of three new peak sanctuaries in the west that are also left unconnected on the map. Aghia Kyriaki Gremnakas (133 m, 436 ft), Plakias Paligremnos (192 m, 630 ft), and Preveli Korifi (371 m, 1,217 ft) all sit on relatively high points along the rugged southern coast of western Crete. They have no intervisibility between each other or any other known peak sanctuary therefore they must have been serviced by a peak that is so far unidentified. By far the most probable site for this unknown sanctuary is the small island of Gavdos that lies about 21 miles (33.8 km) south of the western coast. The highest point on Gavdos is 363 meters (1,191 feet) in elevation. Only two sites on Crete could have connected with Gavdos using their mirrors. The most probable of these is the high peak Kophinas (1,166 m, 3,825 ft) and the other is the much lower hilltop shrine Ephendi Christou (128 m, 420 ft) near Phaistos. The "line-of-sight" distance to Aghia Kyriaki Gremnakas from the peak on Gavdos is 38.2 miles (61.5 km), from Gavdos to Ephendi Christou is 44.8 miles (72.1 km) and from Gavdos to Kophinas is 58.5 miles (94.1 km). All of these distances are well within the range of mirror communications and therefore valid possibilities. The most distant "line-of-sight" link so far discussed is the one just mentioned from Gavdos to Kophinas but a much more important link that was still well within the range of their mirrors was from Karfi to Profitis Ilias (536 m, 1,759 ft) on the island of Thera (Santorini) some 79.3 miles (127.6 km) across the sea to the north. Once they discovered they could communicate with Thera and beyond with their mirrors (what a miracle this must have been to them) it would have become a military and administrative necessity to connect the rest of their naval empire to Knossos and Thera. 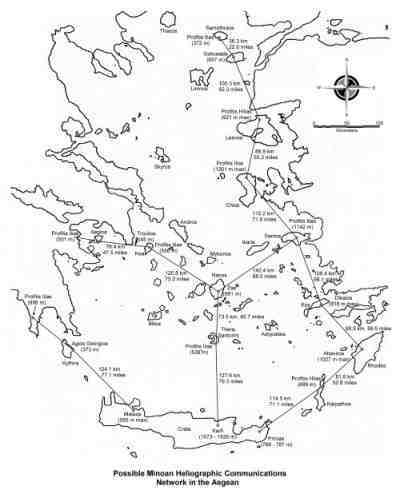 The range of their mirrors allowed them to easily link their solar communications network to almost any point in the Aegean from the island of Samothrace in the north to Crete in the south. Before the establishment of the Peak Sanctuaries and the invention of writing (Cretan Hieroglyphics & Linear A) on Crete, in order for someone in Knossos to send a perhaps vital, time-critical message to say Phaistos it would have required transporting the human memory containing it something like 50 km (31.1 miles) on Crete's roads and paths of the time. The sender would clearly recite the message to the person assigned to deliver it who would in turn commit it to memory. This verbal message would have conveyed the most information possible with brevity being of the essence. To this end special words that encapsulated a concept or idea(s) would have been created and used. Generally the longer the message the more difficult it is to retain in memory. With the message memorized the courier could simply walk or ride a donkey to Phaistos which would take something like two days. 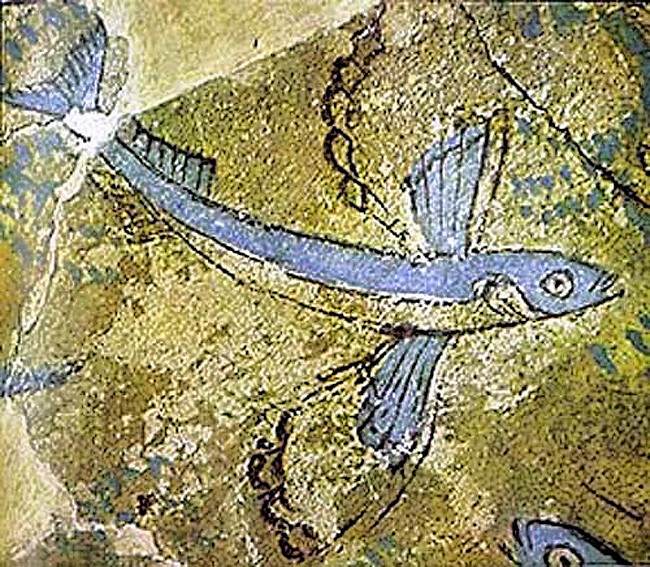 With no horses on the island and given the high priority of the message the fastest way to deliver it at the time would be to employ a number of swift runners prepositioned along the way and transferring the message from runner to runner until it was finally delivered to its recipient in Phaistos. Assuming a reasonable running speed of about 10km/hour (the current world record for 10 km is 26:17.53 minutes set on August 26, 2005 by Kenenisa Bekele of Ethiopia) the delivery of the message would have taken something like 5 hours. With people specially selected for their memory skills and running ability this "human express" could have achieved significantly faster delivery times while carrying longer messages. While this would have been the most advanced system of long-distance communications on land at this time its main disadvantage was the necessity of transferring the memory of the message multiple times. The accuracy of the message would have depended on the weakest memory among the runners. Possible evidence for the "human express" can be found on the right side of the Miniature Frieze fresco from Akrotiri. There is a structure depicted with a human figure standing in a doorway on top of the left most tall peak from the right side of the fresco. This is almost certainly a peak sanctuary. To the right and further down the side of the peak several human figures that appear to be running are shown. Some of these figures are running up to the peak sanctuary and others are running away from it. 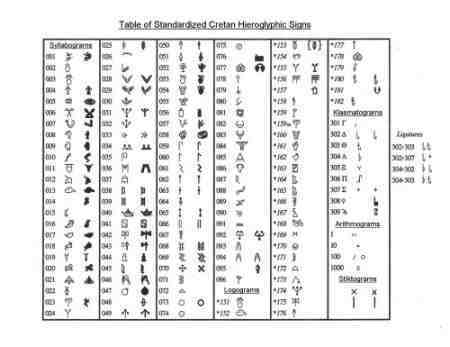 The communications system based on human memory could have been in existence for thousands of years on Crete prior to the invention of the first Minoan writing system - Cretan Hieroglyphics. The "human express" would have continued into the time of writing but memorization would generally have been replaced by the drawing of permanent symbols with ink on parchment carried in a satchel or pouch vastly expanding the amount of accurate information that could be exchanged. 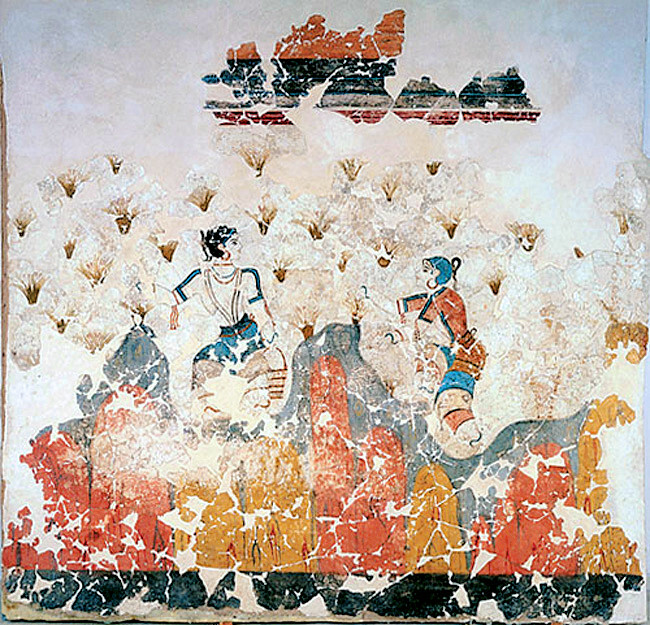 Once the Minoan political and military leadership in Knossos fully grasped the extraordinary capability of their mirrors to reliably flash signals out to great distances in the sunny Aegean the wheels surely would have begun turning to create an integrated heliographic communications network that informationally linked their important population centers. 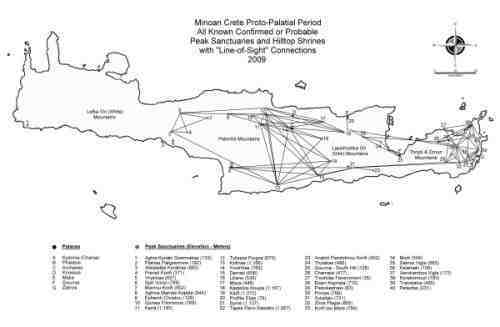 If you could send a message 50 or 80 miles (80.5 to 128.7 km) using the light of the sun in a matter of minutes with a network of mirror communications sites instead of relying on the time required to transport the human memory of it by land or sea it would have been a huge advance in Minoan information technology. An advance far too great to ignore. The Minoans of the time before the start of the Proto-Palatial period must have known of the hieroglyphic and hieratic writing systems of the Egyptians and cuneiform writing of the Sumerians which had been in use for hundreds of years and yet they didn't feel the need to bring literacy to their islands for all that time. 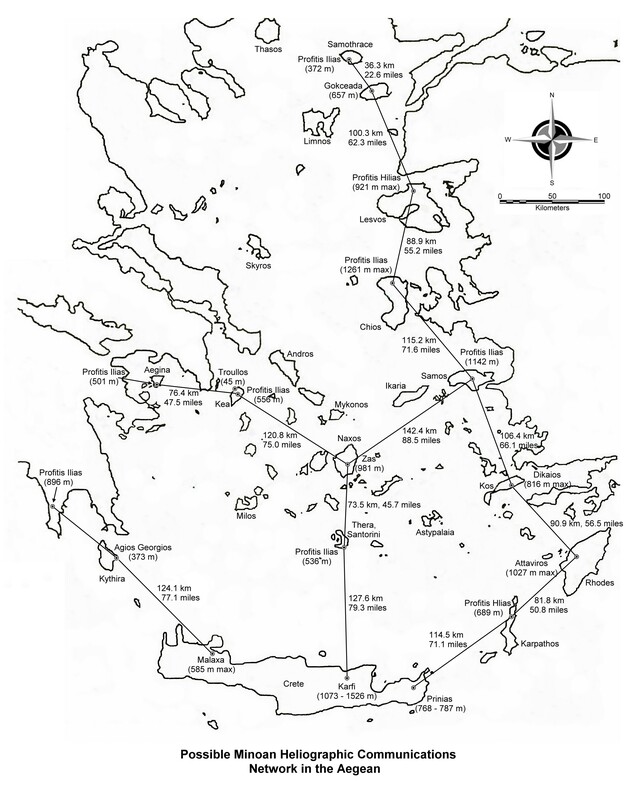 In order to implement a solar communications system in the Aegean three interdependent components are required to work seamlessly together - solar communications sites selected for their "line-of-sight" intervisibility in relation to population centers, a collection of drawn symbols that could adequately describe their spoken language along with other symbolic concepts and ideas, and the mirror flash codes that would uniquely be assigned to each drawn character in their writing system. The lack of any one of these renders the system inoperable. The first appearance of Minoan writing can be found on seals from Archanes Phournoi that display the Cretan Hieroglyphic script dated to the Middle Minoan I (MM IA or IB) period (J. 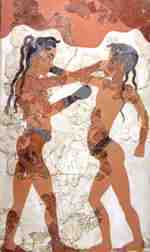 Younger, The Cretan Hieroglyphic Texts). This is archaeologically synchronous with the Middle Minoan I (MM I) dating for the establishment of the Proto-Palatial system of peak sanctuaries on Crete (L. V. Watrous, 1995). The first certain appearance of Linear A is from the Middle Minoan II (MM II) period. Apparently the two scripts were used concurrently throughout the Middle Minoan II and III periods on Crete. 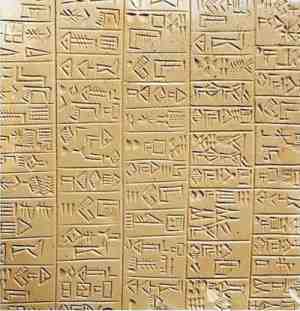 It's not known why these quite different writing systems would have coexisted in these periods. There has been discussion over the years that they were used regionally or represented two different governments or languages. 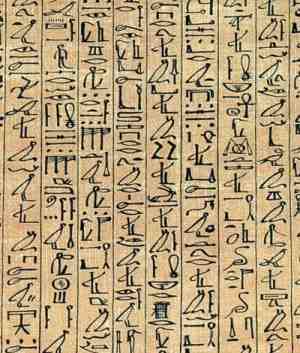 But Cretan Hieroglyphics had one great weakness - the time required to draw its relatively complex characters. 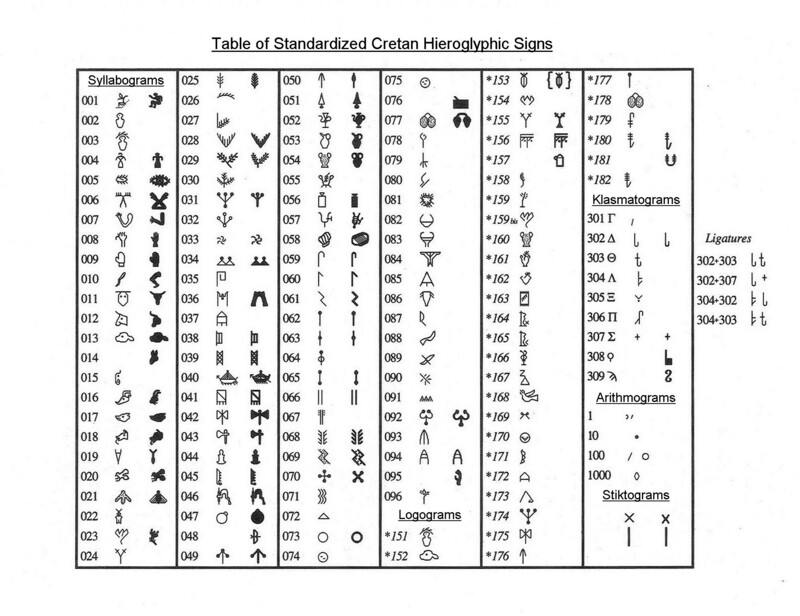 It is thought that the undeciphered collection of symbols the Minoans selected for Cretan Hieroglyphics comprised a complete general purpose writing system designed to represent the elemental vocalizations of their spoken language (a syllabary), their numbering system, and figures that represented the words that conveyed a special meaning or idea (logograms) that had probably been used long before the initiation of writing. When it was originally designed it must have seemed to be an excellent creation that was much more efficient than the other writing systems of the day. 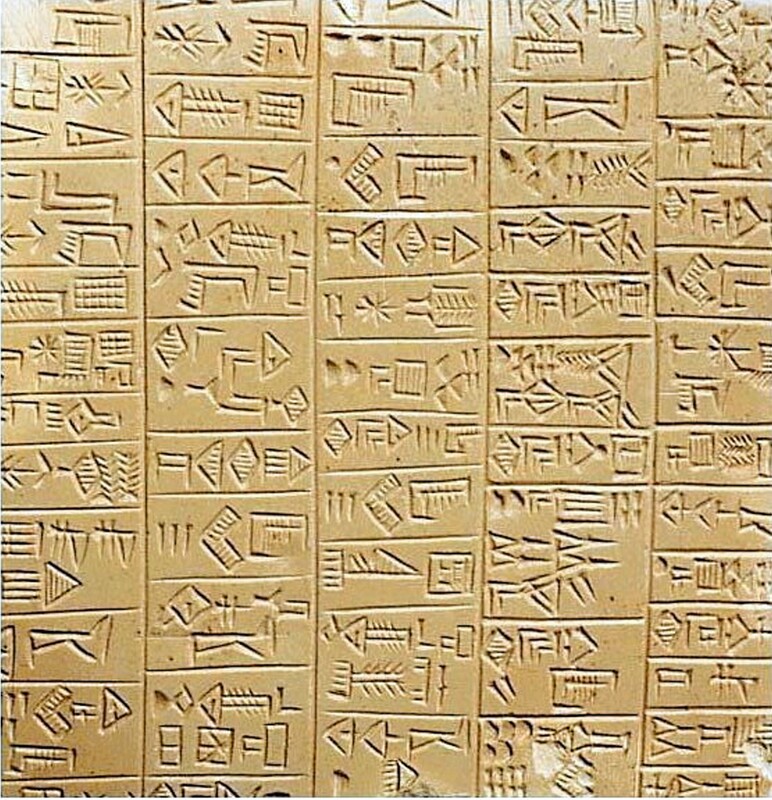 Being designed as a syllabary it had many fewer characters than cuneiform or the Egyptian systems and would have been significantly easier to learn. A syllabary is a writing system that uses drawn characters to represent the elemental sounds (syllables) of a spoken language. A syllable is typically the vocalization of a single vowel or a vowel accompanied by one or two consonants. But when implemented into the solar communications network they probably would have noticed the mirror operators could flash character codes faster than they could be read and transcribed on parchment. 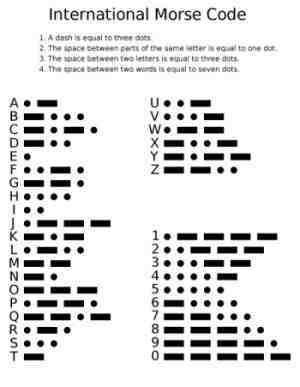 It's estimated that a modern naval signal lamp operator can flash its shutter at a typical rate of about one character of Morse code per second. This works out to a transmission rate of approximately 60 characters or 12 words per minute. Many of the Cretan Hieroglyphic characters would have been difficult to draw in one second or less. This would have required the sending mirror operator to slow their transmission rate to accommodate the transcriber on the receiving end. Communications bottlenecks would have more probably occurred with a script that took more time to draw. By counting the stylus strokes required for a sampling of the characters of each writing system I've estimated that Linear A is something like 50% faster to transcribe than Cretan Hieroglyphics because of the relative simplicity of its characters. Linear A (also a syllabary) may have been invented some time after the introduction of Cretan Hieroglyphics in response to this weakness. Whatever the case Cretan Hieroglyphics completely disappears sometime during the Middle Minoan III (MM III) period. 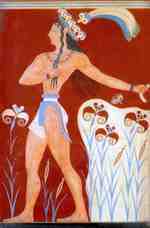 From that point on Linear A flourished as the only writing system in use by the Minoans (J. Younger, Linear A Texts in phonetic transcription & Commentary) until the Late Minoan IB (LM IB) destruction event on Crete. 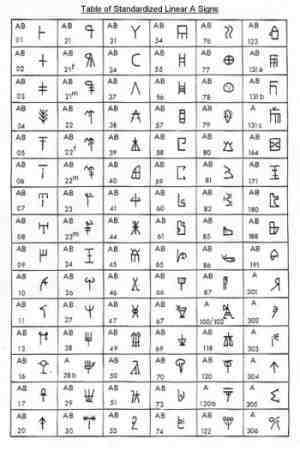 With the completion of the design of Cretan Hieroglyphics the mirror flash patterns (codes) identifying each character in the writing system could then be assigned. This could be completely arbitrary but simplicity and brevity would have been an overriding consideration. There is only a very limited number of ways you can create flash patterns to effectively send character codes with a mirror. 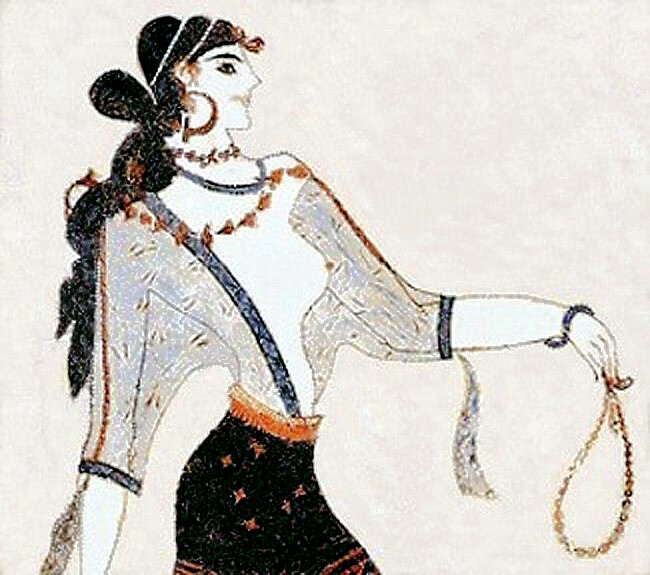 The flash patterns developed by the Minoans would probably have been similar to those used in modern Morse code. 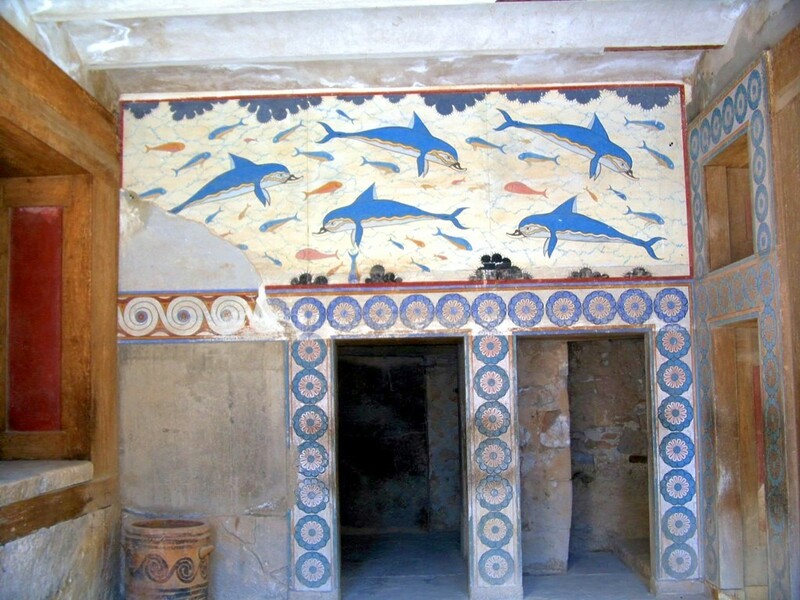 The archaeologically simultaneous appearance of writing and the peak sanctuaries on Crete is perhaps the most startling of the markers that identify the beginning of the Minoan Palatial period and both could well have been developed at the same time. 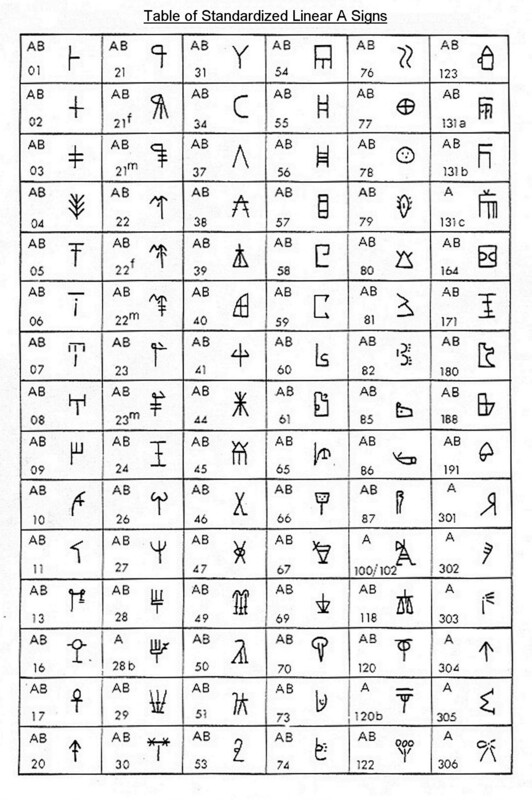 The writing system symbols and their corresponding flash codes could have been in development in one of the palace centers while the best communications sites were being surveyed and identified. Many of the Proto-Palatial peak sanctuaries were abandoned by the beginning of the Neo-Palatial but the most important sites that formed the network backbone continued on until the collapse of the LM IB destruction event - Karfi, Kophinas, Malaxa, Petsofas, Prinias, Syme, Traostalos, Tylissos Pyrgos, Vrysinas, and Youkhtas. 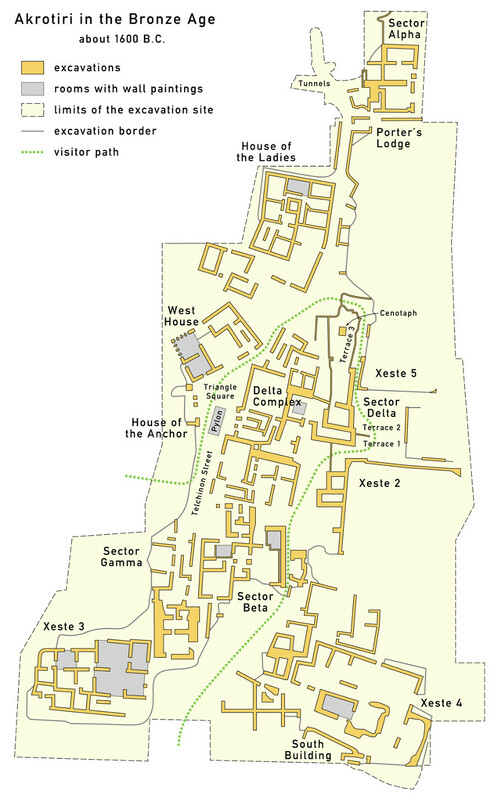 Besides the elimination of Cretan Hieroglyphics and the peripheral peak sanctuary sites the most important new expression of the Neo-Palatial transformation was the construction of about 40 Neo-Palatial Villas distributed throughout Crete and a system of all-weather stone roads that connected them to the palace centers and each other. The reorganization and modernization of their infrastructure would have provided many advantages over the old Proto-Palatial model. Besides generally easing travel the road system would have lubricated and stimulated commerce throughout the island and was especially important in maintaining cart and wagon traffic during Crete's rainy winters. The administrative centers (Neo-Palatial Villas) which were extensions of the palace centers could have provided their local populations with many of the aspects of public administration we have come to expect from any modern government - court system, postal service, tax collection, criminal detention, etc. All local and regional messaging could be delivered by courier or picked up at the nearby administrative center. High priority or inter-regional messages could be flashed directly up to nearest backbone site from one of the villas. Messages would probably have been delivered to over 90% of the population anywhere on Crete within two days using the solar communications network in combination with a human/donkey based courier service. This is similar to the performance of a modern postal system. The security and privacy of the communications system would have been greatly enhanced. While heliographic communications is relatively secure with the beam only visible near the line of transmission if an undetected person was situated close to the beam at the receiving end and knew how to read the flash patterns messages could be intercepted. By greatly reducing the number of solar sites and leaving just the backbone of the system in place they would have significantly reduced the possibility of surreptitious interception of light messages from the network. During the South African Boer war in the early 20th century heliograph crews were acutely aware of this and used tubes and sometimes rifle barrels to limit any dispersion of the beam being sent (Harris, South African Military History Society, Military History Journal, Vol 11, No 1). 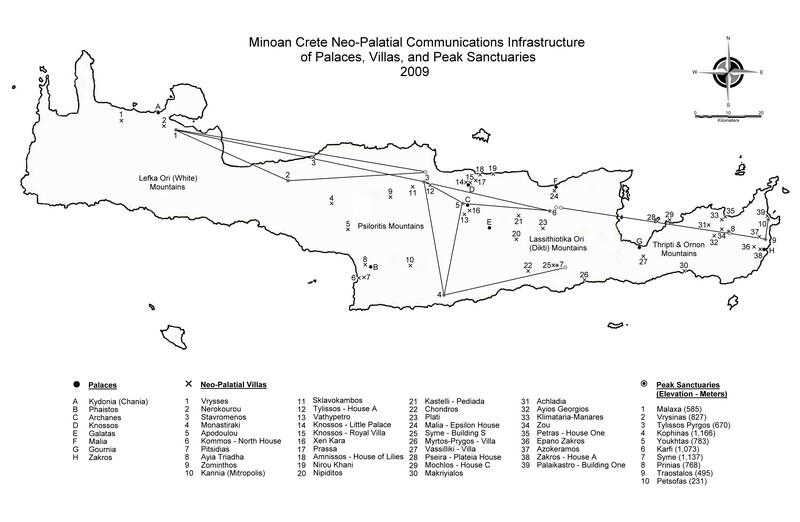 Just as the Proto-Palatial invention of writing and establishment of the peak sanctuaries was an expression of societal unity the Neo-Palatial transformation of Crete's infrastructure is clearly a demonstration of a powerful, insightful, and forward looking Minoan nation state. 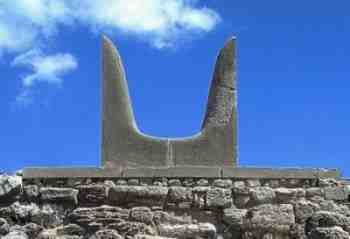 E. Banou, "Minoan 'Horns of Consecration' Revisited: A Symbol of Sun Worship in Palatial and Post-Palatial Crete? 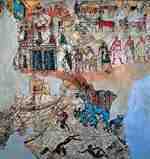 ", Mediterranean Archaeology and Archaeometry, Vol. 8, No. 1, pp. 27-47, 2008. 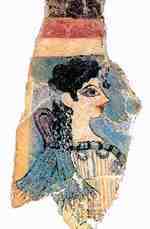 N. Marinatos, "Minoan Kingship and the Solar Goddess: A Near Eastern Koine", University of Illinois Press, 2010. 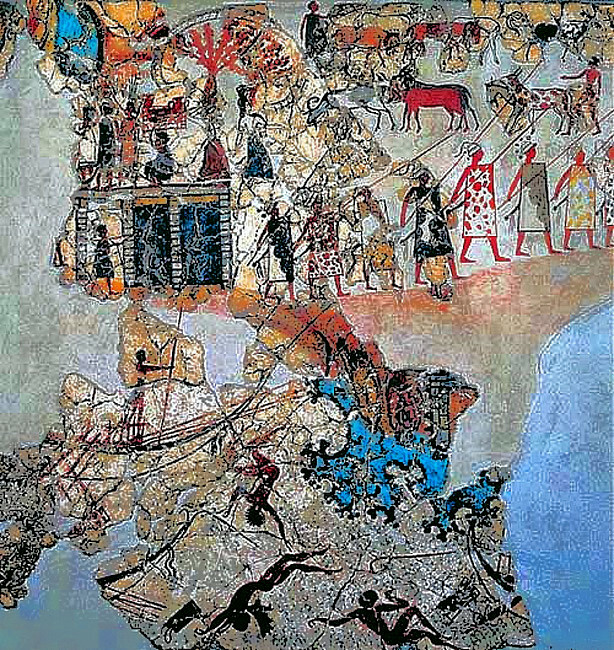 E. Kyriakidis, "Ritual in the Bronze Age Aegean: The Minoan Peak Sanctuaries", 2005. J. L. Myres, "Excavations at Palaikastro II", Annual of the British School at Athens, Vol. 9, pp. 356-87, pls. 7-13, 1902-3. 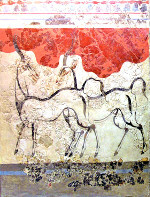 R. Castleden, "Minoans: life in Bronze Age Crete", 1993. J. M. Enoch, "Archeological optics: the very first known mirrors and lenses", Journal of Modern Optics, 1362-3044, Volume 54, Issue 9, pp. 1221-1239, 2007. 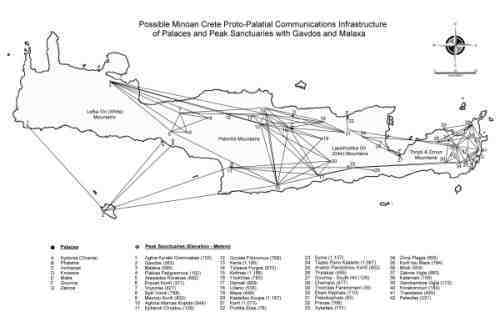 K. Nowicki, "Minoan Peak Sanctuaries: Reassessing Their Origins," in R. Laffineur and R. Hagg, Potnia. Deities and Religion in the Aegean Bronze Age, Aegaeum 22, Liege/Austin, pp. 31-37, 2001. K. Nowicki, "Some Remarks on New Peak Sanctuaries in Crete: Topography of a Ritual Area and Relation with Settlements", Jahrbuch des Deutschen Archaologischen Instituts, Vol. 122, p. 1-31, 2007. A. Peatfield, "The Atsipadhes Korakias Peak Sanctuary Project", Classics Ireland 1, pp. 90-95, 1994. A. Peatfield, "The topography of Minoan peak sanctuaries". Annual of the British School at Athens, Vol. 78, pp. 273-280, 1983. 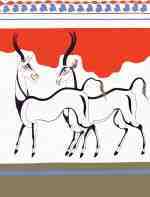 L. V. Watrous, "Some Observations on Minoan Peak Sanctuaries," in R. Laffineur and W-D. Niemeier (eds. 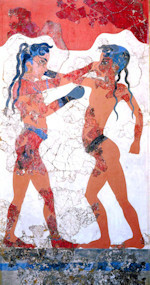 ), Politeia: Society and State in the Aegean Bronze Age, Aegaeum 12, Liege II, pp. 393-403, 1995. S. Soetens, Driessen, A. Sarris, S. Topouzi, "The Minoan Peak Sanctuary Landscape through a GIS approach", Archeologia e Calcolatori 13, 2002, (XIVth Congress of the International Union of Prehistoric and Protohistoric Sciences, Liege Belgium, pp. 161-170, 2 - 8 September 2001). S. Soetens, A. Sarris, S. Topouzi, A. Tripolitsiotis, 2001, "GIS Modeling of the Minoan Peak Sanctuaries of East Crete", CAA, 2001. (Archaeological Informatics: Pushing the Envelope. Computer Applications and Quantitative Methods in Archaeology. Proceedings of the 29th Conference, Gotland, pp. 129-138, April 2001). 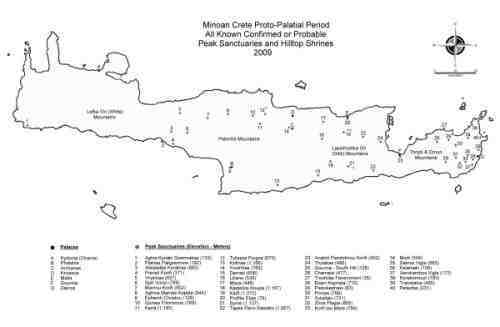 S. Soetens, A. Sarris, K. Vansteenhuyse, S. Topouzi, "GIS Variations on a Cretan Theme: Minoan Peak Sanctuaries", in K. P. Foster and R. Laffineur (eds. ), Metron: Measuring the Aegean Bronze Age, Aegaeum 24, Liege/Austin, pp. 483-488, 2003. 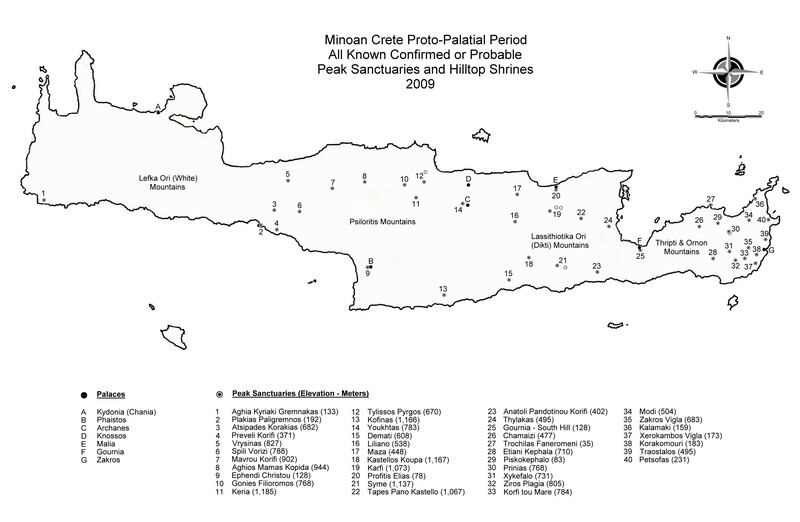 S. Soetens, A. Sarris, S. Topouzi, "Peak Sanctuaries in the Minoan Cultural Landscape", Pepragmena tou Q' Diethnous Kretologikou Synedriou, Heraklion, pp. 76-82, 2006. S. Chryssoulaki, "The Traostalos Peak Sanctuary: Aspects of Spatial Organization", in R. Laffineur and R. Hagg, POTNIA. Deities and Religion in the Aegean Bronze Age, Aegaeum 22, Liege/Austin, pp. 57-66, 2001. 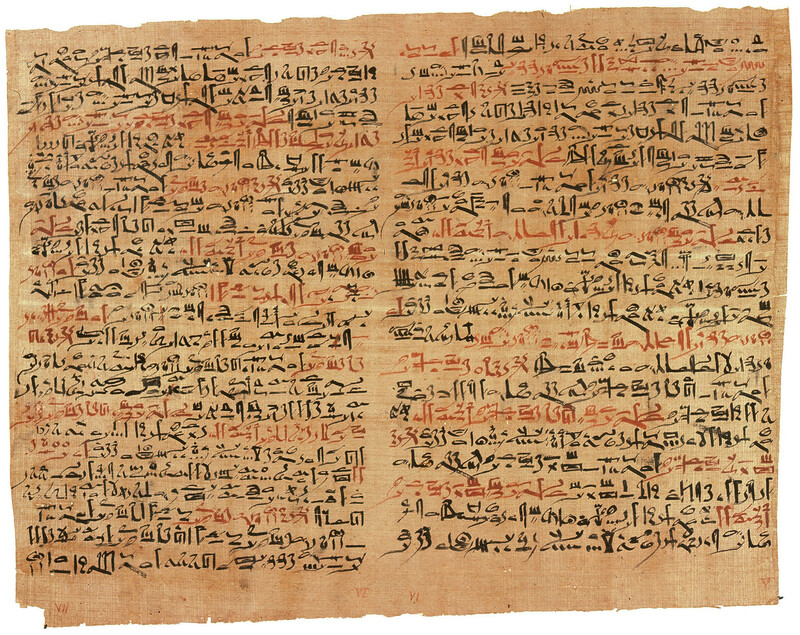 J.-P. Olivier, L. Godart, "Corpus Hieroglyphicarum Inscriptionum Cretae". Etudes Cretoises 31, Paris: De Boccard, 1996. I. Schoep, "The Origins of Writing and Administration on Crete", Oxford Journal of Archaeology, Volume 18, Issue 3, pp. 265-276, 1999. I. Schoep, "The Administration of Neopalatial Crete: A Critical Assessment of the Linear A Tablets and Their Role in the Administrative Process", Salamanca: Ediciones Universidad Salamanca, 2002. H. C. King, "The History of the Telescope", London: Charles Griffin & Co. Ltd, 1955. B. A. Colonna, "Nine Days on the Summit of Mt. Shasta", The Californian, 1880. (Reprinted in The Journal Coast and Geodetic Survey, Number 5, pp. 145-152, June 1953). G. Dunnington, "Carl Friedrich Gauss, Titan of science: a study of his life and work", Exposition Press, 1955. L. Coe, "The Telegraph: A History of Morse's Invention and Its Predecessors in the United States", McFarland, 1993. (Reprinted 2003). C. Chun, "US Army in the Plains Indian Wars 1865-1891", Osprey Publishing, 2004. N. Miles, "Personal recollections and observations of General Nelson A. Miles, embracing a brief view of the Civil War: or, From New England to the Golden gate, and the story of his Indian campaigns, with comments on the exploration, development and progress of our great western empire", The Werner Company, 1896. "Report of the General Practice of the Heliograph System", Department of Arizona, in May 1890, Under Direction of Major W. J. Volkmar, Asst. Adjutant General, Chief Signal Officer, Department of Arizona, Washington City, Signal Office, 1890. (Credit: Richard A. Fowell). Major J. D. Harris, "Wire at War - Signals communication in the South African War 1899-1902", The South African Military History Society, Military History Journal, Vol 11, No 1.